Bills super fan Ezra Castro, known as Pancho Billa, is ramping up his fight against stage four cancer. 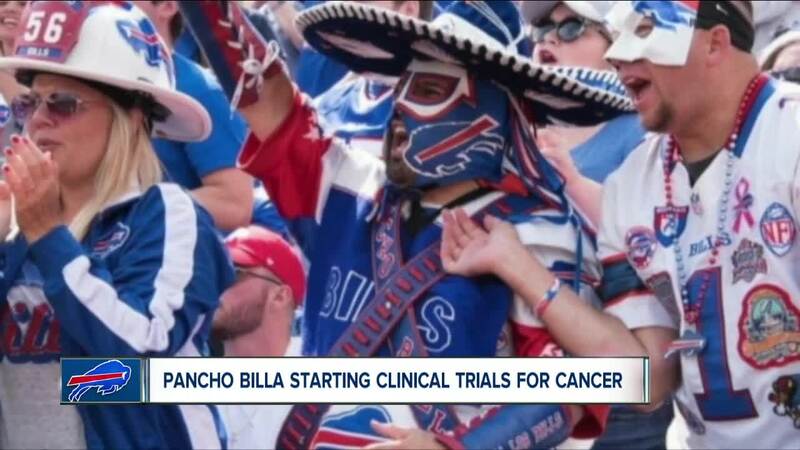 (WKBW) — Bills super fan Ezra Castro, known as Pancho Billa, is ramping up his fight against stage four cancer. Castro, who lives in Dallas, announced on twitter that he'll be starting clinical trials at a cancer center in Houston. He says the decision comes after a scan that was more negative than positive. Late last year, Bills Mafia surprised him and his family with an all-expenses-paid trip to Disney World. He also became the first person inducted into the Buffalo Fan Wall of Fame. For more on who Ezra Castro is and how he became a Bills fan in the first place despite growing up in Texas, click here for an interview he did with 7 Eyewitness Sports Reporter Matt Bove.